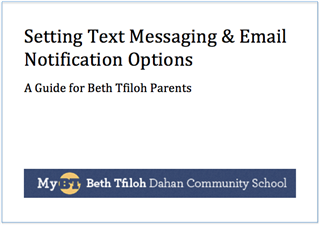 Beth Tfiloh parents, students and staff can choose to receive text messages and e-mail messages for important updates and changes to the Beth Tfiloh schedule. You may access and change your email or text settings at anytime. Note: Your cell phone carrier may charge a fee for these services. 4. Verify (or add) your email address. This will be the email address used for all emails from Beth Tfiloh. 5. Verify (or add) your text number. This will be the text number used for all text messages from Beth Tfiloh. 6. Choose which notifications you would like to receive by checking the appropriate boxes. Announcements - choose Edit Options to select the types of Announcements you would like to receive. NOTE: Check "Weather Updates" to receive weather-related information. Be sure to click SAVE after editing your choices. Athletic Schedule - note that Game Reminders and Practice Reminders allow you to edit the time for the reminder. Be sure to choose SAVE after editing your choices. 7. IMPORTANT: You will then be sent a text message on your phone with an activation code that must be entered in order to activate text messaging. If you have inadvertently marked one of our BT emails as SPAM, you may be blocked from receiving all of our BT emails. Use this link to learn how to request that our email service unblock your email account. Beth Tfiloh email may be showing up in the Social tab in Gmail instead of the Primary tab. See instructions in the sidebar on the right for how to remedy this problem. The videos below provide instructions to those with Gmail accounts for how to avoid two common reasons why you might not be receiving BT email: the Gmail SPAM filter, and Gmail tabs. Have you noticed the new tabs in your Inbox? You may find that some of your BT emails are ending up in your "Promotions" tab. Here's a step-by-step tutorial on how to configure your tabs to make sure you're not missing any important BT emails!